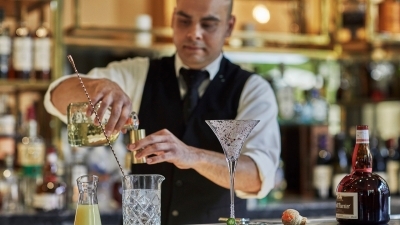 Las Vegas, U.S.A., 2019-Feb-08 — /Travel PR News/ — PRESS bar at Four Seasons Hotel Las Vegas welcomes two guest mixologists from Miami-based sister property, Four Seasons Hotel at The Surf Club, this March for a night of cocktail creativity. On Monday, March 4, 2019, PRESS Bartender Ross Ziga will be joined behind the bar from 5:00 to 8:00 pm by Le Sirenuse Champagne Bar’s award-winning Jacopo Rosito and Valentino Longo. A native Nevadan, Ziga joined Four Seasons Hotel Las Vegas for the opening of PRESS in 2013. Known for his infectious smile, Ziga is a popular personality with both locals and Hotel guests, and brings a passion for mixing up classic cocktails with a twist. On March 4, he will team up with mixologists Rosito and Longo, who are making their way across the USA for a series of one-night-only guest bartending events called “The Art of Bartending.” Held at host bars at Four Seasons properties in each of five cities including Los Angeles, San Francisco, Chicago, Austin and Las Vegas, the event features a custom menu of elevated highball cocktails and will showcase their passion for the craft. Both native Italians hailing from Florence and Rome respectively, Rosito and Longo have honed their craft through a wealth of global experience working behind bars in Italy, London, San Francisco and Miami. Now at the helm of Le Sirenuse Champagne Bar, their imaginative cocktails and charismatic service capture both the essence of the original Amalfi Coast resort and the spirit of The Surf Club’s glittering past, as they aim to establish the bar among the world’s best. Each event is open to the public. RSVP by visiting Four Seasons Hotel Las Vegas Facebook page. Follow the Hotel @FSLasVegas and The Art of Bartending through the hashtag #ArtofBartending. This entry was posted in Business, Festivals and Events, Food & Drinks, Hotels, Resorts, Travel, Travel Services, Travelers and tagged cocktail, creativity, Four Seasons Hotel, Jacopo Rosito, Josh Loving Aaronson, las vegas, Le Sirenuse Champagne Bar, mixologists, PRESS bar, Ross Ziga, Valentino Longo. Bookmark the permalink.